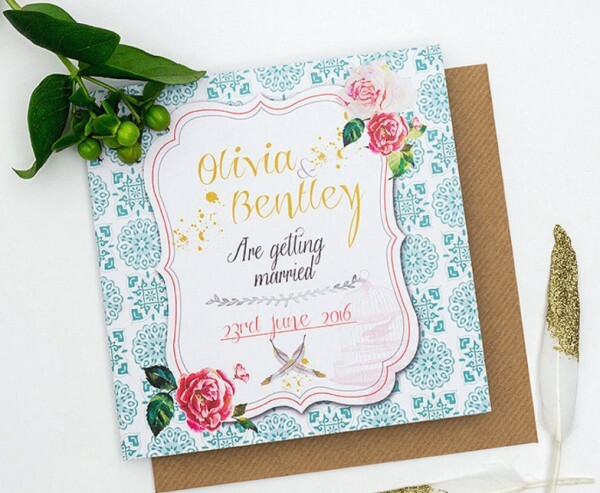 Whether you have been inspired by travelling or you like the look and style of the Mediterranean, you’ll find that the Bohemian Splendour range of wedding invitations will provide you with the perfect backdrop for your wedding invitations. It may be that you are looking forward to a wedding abroad and you want an invitation style that matches your destination or you are just looking for something out of the ordinary. Either way, this is a wedding invitation that stands apart from its peers and will be a pleasant way to inform guests of your special occasion. The background of the invitations has a hand-drawn style that instantly bring to mind the terracotta tiles found across Morocco. If you have ever spent time holidaying or enjoying this part of the world, this invitation will immediately whisk you back, placing you in a more positive frame of mind. The winding streets of old towns in foreign destinations will not be far from your, or your guests, minds when you use the Bohemian Splendour wedding invitation to announce your big event. The information and important details are provided in a lively and colourful font, so this is sure to be an invitation that jumps out and begs to be noticed. There is a wide range of stationery items and packages available with this design, so no matter how much information you have to pass on, you’ll find that you can do so with a touch of class and style with the Bohemian Splendour wedding invitation from Hertas Creative Design.